Have you ever looked down at your ankles and feet, first not recognizing them as your own, then, realizing they are swollen? Whether from long days on your feet, travel or surgery, it happens. For pregnant women, it is almost inevitable. Because your feet are so far away from your heart, it takes them much longer to heal than other parts of the body – this is because it takes much longer to circulate blood from your heart to your feet. 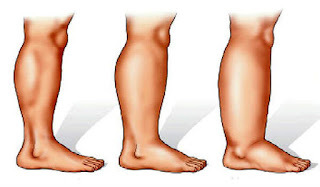 With diabetes and metabolic syndrome growing at skyrocketing rates, it’s now very common to suffer from swollen legs, feet and ankles due to poor circulation and cardiovascular problems, as well as common injuries. There are natural remedies that work wonders for swollen feet! Smoking is one of the top 10 habits to stop right now if you want to be healthy. Exercising stimulates blood circulation and prevents the blood from pooling in your lower extremities. If you’re suffering from painful or inflamed legs, swimming can be the perfect solution. When you float, the impact is taken off your feet, which eases the discomfort. If you’re not quite ready for the headstand yet, try elevating your legs by putting them on a higher surface so that they are above the heart. Do that for 30 minutes, three times a day, and observe the difference. Eat healthy and avoid excess salt. A bit of salt is good for you, and is in fact needed for the body to function well. But too much salt can cause water retention and should be avoided. We are all guilty of often not drinking enough fluids. By drinking water throughout the day, we hydrate our tissues and detox the body.